To facilitate browsing and searching for guest OS files in backup, select the Enable guest file system indexing check box. This setting will provide, in particular, advanced search capabilities when viewing guest OS files and performing 1-Click file restore using Enterprise Manager web UI. If indexing is disabled, you will be able to use only quick search within the selected restore point. For proper Linux system indexing, Veeam Backup & Replication requires several utilities to be installed on the Linux machines: mlocate, gzip, and tar. If these utilities are not found, you will be prompted to deploy them to support index creation. To customize settings of a machine added to the job as part of a container, the machine should be included in the list as a standalone instance. For that, click Add Machine and choose a machine whose settings you want to customize. Next, select the machine in the list and click Edit to define the necessary custom settings. Select Disable indexing if you do not want to index guest OS files of the machine. Select Index everything if you want to index all guest OS files inside the machine. Select Index everything except folders if you want to index all guest OS files except those defined in the list. 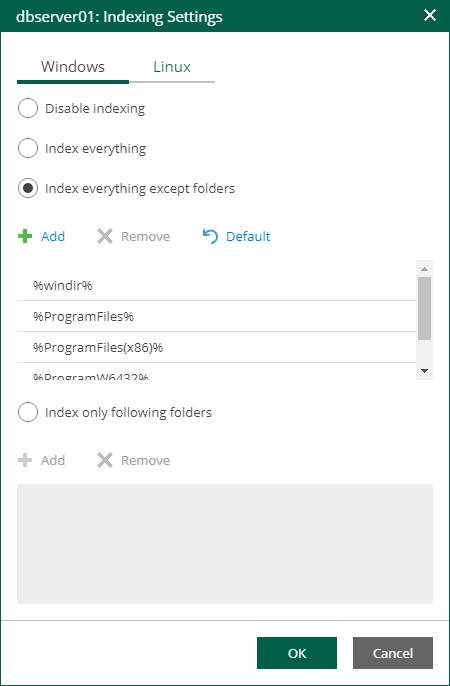 By default, system folders are excluded from indexing. You can add or delete folders to exclude using the Add and Remove buttons. 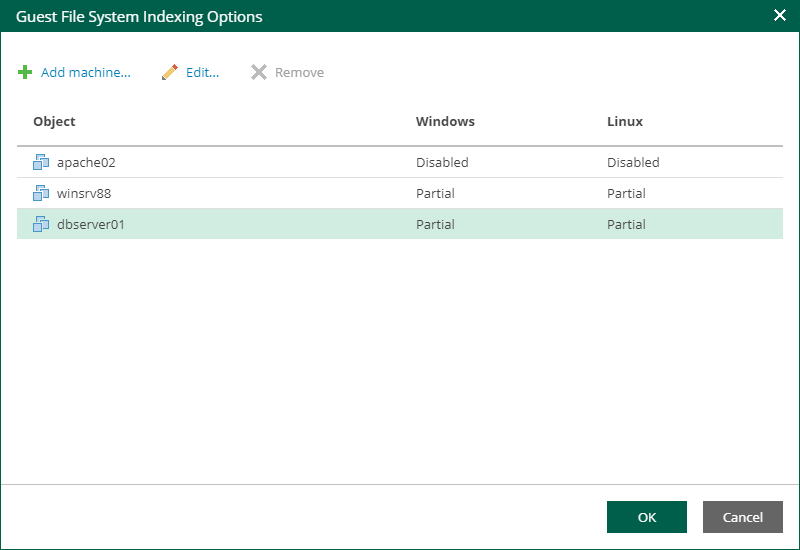 Select Index only following folders to select specific folders that you want to index. To form the list of folders, use the Add and Remove buttons.